Whenever Starla send me a new batch of femulator images that she culled from online school yearbooks, I try to pick out the femulators who are not civilians, that is, girls like us and not one-time femulators dressing up for their school's womanless event. It may be due to all those years operating the trans radar, but there is something about certain womanless participants who give off vibes that they are in it for the long run. And sometimes, there are other clues that confirm those suspicions. Such is the case with Sean Caufield, whose image (above) was in the latest batch that Starla sent me. She is exquisite! Her hair, makeup and jewelry are perfect. And the extra clues move her out of the civilian realm. The clues I am referring to are her thin eyebrows en femme and en homme and the fact that dressing as a female is her choice for a Halloween costume and is not a femulation for a womanless event. And she is not alone. 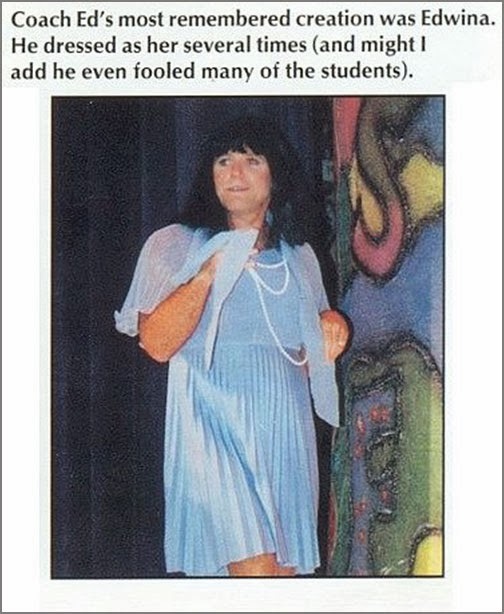 I always suspect that something is up when a faculty member femulates along with the students like the student-teacher above, who "shows off his feminine side on Halloween." Does Miss Waugh's perfect wig, cleanly shaved legs, tailored skirt suit or slingback pumps hint that she shows off her feminine side on other occasions? Just wondering. I was also wondering about Coach Ed (above), who goes by "Edwina" during her frequent forays in frocks, when she successfully passes among her students. 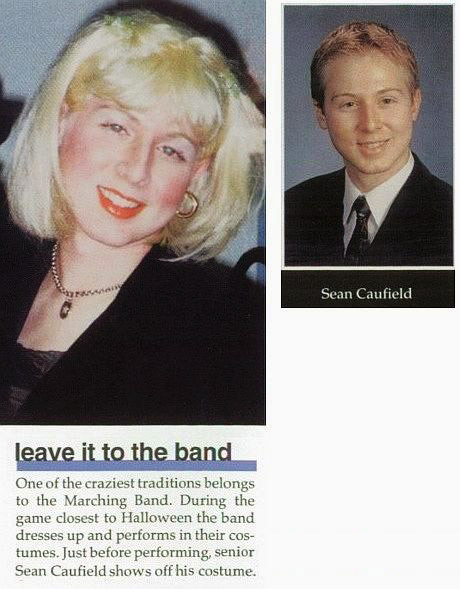 And then there is Matt Garber (above), who "was the only male student to wear make-up to the junior-senior prom," which begs the question: Did other male students attend the prom wearing prom dresses, but without makeup? In honor of my last day at work, here I am the first day I went to work en femme (Halloween 2000). Good luck in your new directions away from full time work ! Hope that you get to enjoy what ever you stout to do! I agree with your opinions. I do not think any of these femulators was a one time event. Congratulations on making it to retirement. I seem to remember your last day is Wed? 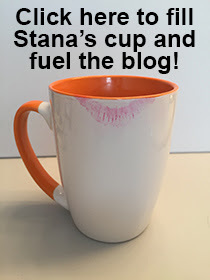 Have you been invited by HR to a dinner as Stana? It would be fitting for an ending and a beginning. I have been retired for 10 years and recommend it to anyone who can afford it. Thank you, Joan. My two former managers (both female) are taking me out to dinner later this week and by "me" I mean Stana. My son went to a School of the Arts, a public magnet school with the usual high school subjects plus theater, technical theater (lighting, sound, etc. ), music, dance, or art. With the eclectic bunch of students that type of school attracts, every year it was a common thing for three or four of the male students to attend the prom wearing gowns and usually in the company of their boyfriends. Part of what they had to do as seniors was an original project or piece they created. These were done in the school theater in front of parents and faculty from their discipline One of the male students in my son's class did a monologue of a woman getting dressed for a date, sitting at the mirror in lingerie doing makeup, getting dressed and talking about the upcoming date. Nobody raised an eyebrow, it was that kind of high school. And I say he was a male student but I know for a fact that she and at least one other in the class have transitioned. lookin' really good in that 2000 picture Stana! enjoy your well deserved retirement and find that dream part time job! And if you do get a dinner with HR, you MUST go en femme.